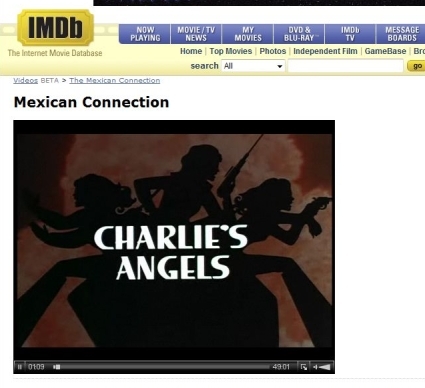 Internet Movie Database, the popular film and TV reference website owned by Amazon.com, has begun showing free streaming movies and television episodes for users in the United States. The site says it's added more than 6,000 feature films and TV shows courtesy of CBS, Hulu.com, Sony Pictures Television and about 500 independent filmmakers. Unfortunately, licensing issues are to blame for the service only being offered stateside. IMDb's new streaming vids are offered gratis, with commercial interruptions and media player banner ads pushing revenue and fronting the bandwidth bill. Amazon also hopes to coax potential customers into clicking the Amazon Video on Demand button to rent or purchase the content, or even buy the DVD on Amazon.com. After a few minutes of viewing, its apparent the video quality isn't tops. 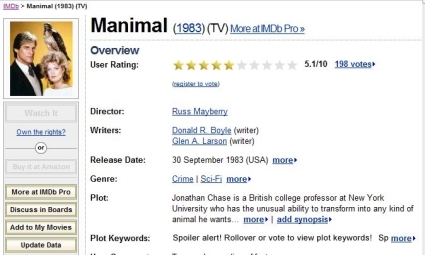 Even content originating (and available) on Hulu seems downscaled for IMDb. All the more reason to purchase the video rather than catch a cheap stream. That's probably what Amazon is going for. It certainly fits nicely into Amazon refreshing its digital video storefront to sell higher quality commercial-free streaming downloads earlier this month. Operators of IMDb have a less commercial spin on the affair. It's a bit...ambitious, not that there's anything wrong with it. "Our goal is to show our users every movie and TV show on the Internet for Free on IMDB.com," Col Needham, founder and directing manager of the site said in a statement.